What makes achieving this postural alignment challenging are the strong forces involved in the horse's movement - their natural unevenness - and on top of that, our own postural crookedness. This combination of misalignments means that riders very often end up sitting unevenly, with their seat positioned more to one side of the horse's spine. Few riders and riding teachers give sufficient attention to correcting this fundamental source of imbalance. The positioning of the saddle on top of the horse's spine is an extremely important part of this picture. Usually the horse's natural unevenness creates a stronger rotation of the rib-cage to one side, and the saddle, being attached to the rib-cage by the girth, follows this, so that the panels of the saddle are no longer evenly spaced on either side of the horse's spine. The rider will often instinctively compensate for this unevenness by sitting over to one side on the saddle, but the unlevel support for the seat means that the pelvis is pushed up on one side, resulting in the all too common collapsed hip. This is illustrated in the right-hand diagrams (with the red lines) in the above illustration. We are all more susceptible to collapsing our hip on one side of our body rather than the other. 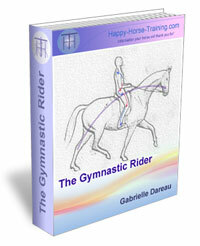 This is one of the most common ways that riders fail to achieve postural alignment. Depending on how this unevenness combines with the horse's natural crookedness, we will either end up with an amplified imbalance between our body and that of the horse, or with a compensatory dynamic, where our own unevenness fits in with the horse's. Both situations are a barrier to developing balanced movement in riding work. Another very common issue is lack of postural alignment between horse and rider in any kind of bending work, from the most simple turns and circles to the most challenging lateral work. When the horse turns their body, there is invariably a stronger pushing of the rib-cage towards the outside of the bend, corresponding with the pushing off of the inside hindleg. Again, this is either amplified or masked by the horse's natural crookedness, so there will usually be one rein (the non-natural bend side of the horse) on which this outward rotation is more marked than the other. The saddle is pulled into this strong roll to the outside that happens every stride, and the weighting of the rider's seat will drop away to the outside. In this situation, we may lean our upper body back to the inside in an attempt to regain balance, but with our seat out of alignment with the horse's spine, it is impossible for us to have a positive influence on the horse's balance. In this position, with more of our weight to the outside, we cannot give the horse the postural support down the inside of the ribcage that is necessary in order to allow the horse to flex their body onto the bend. 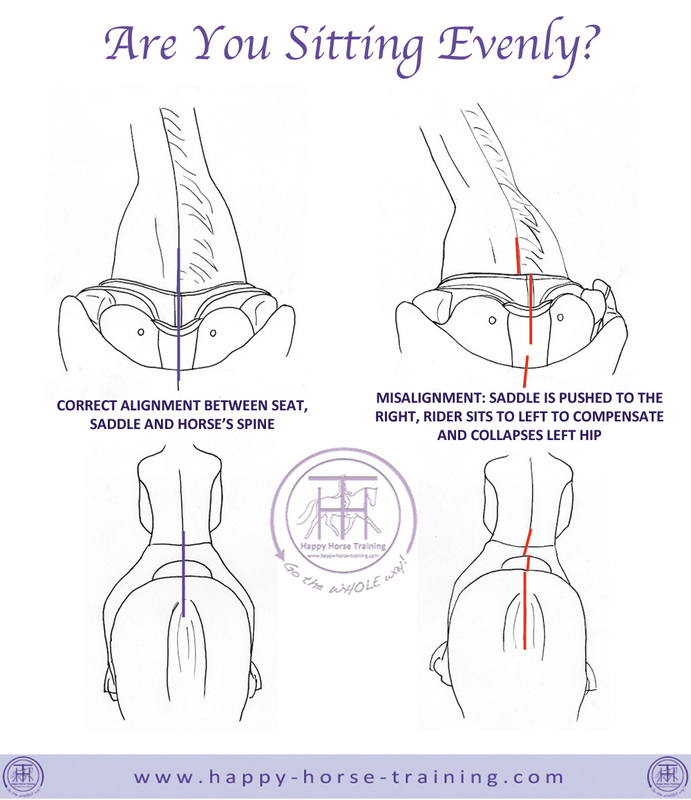 With such a lack of postural alignment between our seat and the horse's spine and rib-cage, our leg aids are futile, and the lack of balance will manifest in the contact as either resistance in the inside rein, or leaning on the outside rein. Note, in the right-hand diagram, the rider's outside (right) leg propping forwards to support the weight falling to the outside. Not only is this highly unbalancing for the horse, but it prevents the outside leg from fulfilling its correct function of stretching back to form the haunches onto the bend. The solution to all of these misalignment issues is to constantly work towards an even positioning of both our seat and the saddle over the horse's spine. The first step is to increase our awareness of the misalignments that are going on when we ride. One very good way to do this is to start looking regularly at both the positioning of the saddle in relation to the horse's spine, and at where you sitting on top of the saddle. You can see this easily by looking down at the saddle in front of your seat, as shown in the top diagrams in the illustration. Find the mid-line of your saddle's pommel, and see how that lines up with the mid-line of your horse's withers just in front of it. Then look at the mid-line of your riding breeches (assuming you're wearing them evenly!) and see how this lines up with the imaginary mid-line on your saddle's seat. Try to make regular glances instead of looking down for long periods at the front of the saddle, so you avoid dropping your head too much. Be aware that even a few centimeters of misalignment between the saddle, your seat and the horse's spine have a huge impact on the overall influence of your posture on the horse's balance! Of course, when the horse is moving, the movement of the ribcage means that both you and the saddle will move from side to side, but try to observe, and then to feel, whether there is more movement over to one side than there is back in the other direction. It is also a very good idea to have someone take pictures or film you from the back, so that you can see how misalignments are manifesting in the back of the seat - often we have a twist in the pelvis that makes us sit to one side of the saddle at the back of the seat-bones, and to the other at the front of the pelvis. The next step is, of course, to set about correcting the various misalignments. If you have identified a stronger rib-cage rotation towards one side (i.e. the saddle is being pushed over to one side more than the other) then your goal is to set about correcting that by using your postural resistance. You must use a stretching down the opposite side of your body, sending the weight down into your seat-bone and stirrup on the side on which the horse is pushing you up more (in the example of the right-hand diagrams, this would be the left side. You must use as much weighting of the stirrup and seat-bone as it takes to bring the saddle back even over the horse's spine. This will give you a more level support for your seat, and allow you to correct the collapsed hip by stretching your waist more on this side. It is vital to realize that creating an even positioning of the seat and saddle over the horse's spine often means weighting your seat and stirrups UN-evenly. 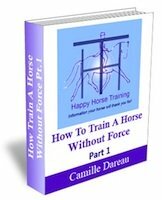 Over time, as you and the horse become straighter, you will be able to distribute your weight more equally while remaining central. In bending work, focus your attention on the moment when the rib-cage rolls to the outside, as the inside hind pushes off. Instead of following into that roll with your seat, and allowing the saddle also to follow into it, start working on keeping your weight down into the inside stirrup at this moment, keeping your inside waist stretched instead of allowing it to buckle. A great exercise is to actually remove your outside stirrup during bending work, so that you can no longer use it as a prop for weight falling to the outside (make sure you are not gripping with the thigh either) then you will have to commit your weight down the inside and keep and central position in order to balance. Your horse may well react initially to this change in your weight and postural orientation by pushing in against your inside leg in an attempt to reassert the habitual posture. This is when you must use the inside leg, in massaging aids, to encourage yielding of the rib-cage, without letting your weight shift to the outside again. This is not any easy task! Bringing about this kind of postural change in you and the horse is the work of long-term, assiduous practice, always looking for the verification of improvement in the horse's balance and longitudinal transmission from back to front. 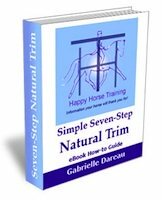 However any small change in the right direction brings you into much greater harmony with the horse, and will also increase your security while riding in any context.